For the last 10 years, the Rotary Club of Cranleigh, led by Rotarian Brian Vine, and the Cranleigh Tortoise and Hare Runners, have been organising long distance races for adults and juniors. The event is now an established part of the annual racing calendar, and it has proved to be a tremendous success. 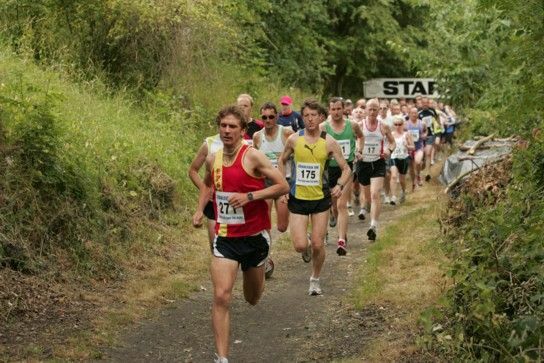 The races in 2010 and 2011 both raised more than £1,600 for Rotary charities, and the 2013 event was even more successful, raising around £1,800. This year, the course was partly off road and partly on public roads. and fewer runners took part, but the event still raised £1,300 for the Club's charity fund. James Baker, the winner in 2010, returned to Cranleigh for this year's race and won again, completing the course in 33 min. dead, 10 seconds faster than four years ago! The second runner to finish was Guildford & Godalming athlete Thomas Griffiths in 34 min. 11 s, with Martin Bateman of Hillingdon AC, third in 35 min. 32 s.
The first lady to finish was Tanya Boardman in a time of 45 min. 59 s. Second was Pipa Turley in 46 min 23 sec, with Lorrain Treadwell coming in third in 47 min. 25 s.
The winner of the Junior 3k race (Boys 10 and Over) was Daniel Hagen, in a time of 14 min. 42 s. Second was Tom Ambrose in 14 min. 54 s. First in the 'Boys 9 and Under' category was Tom Dare, with a time of 16 min. 11 s.
The leading girls were Annabelle Ambrose (Girls 9 and Under) in 19 min. 50 s, followed by Emily Hutchinson in 20 min. 2 s.
The race organiser, Rotarian Brian Vine, thanked everyone who helped and took part in the successful event, especially the Cranleigh Tortoise and Hare Runners.